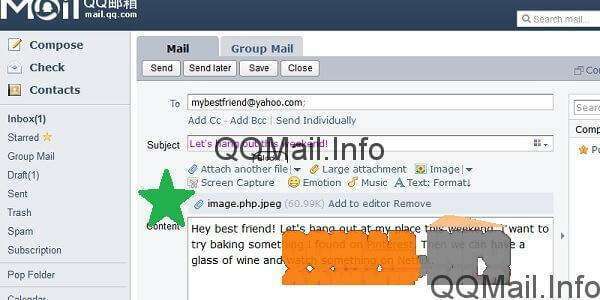 These days, almost everyone on earth has an email address, and many people have more than one. With all the different people in our lives – friends, family, coworkers, etc. 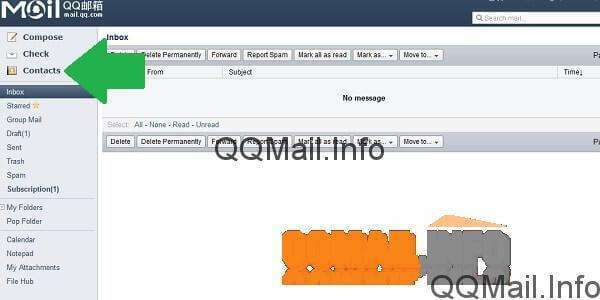 – it’s impossible to keep track of all of those email addresses by memory. And the thought of trying to organize everything into a paper address book is overwhelming just thinking about it. 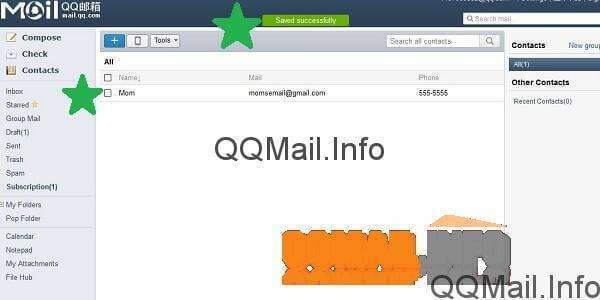 Luckily, most email services, including QQ Mail, let you save and organize your contacts quickly and easily. 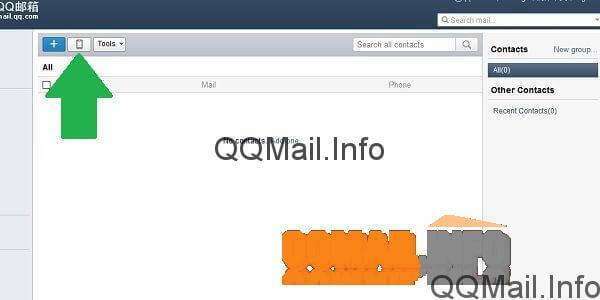 In this post, we’ll walk you through the process of adding and deleting contacts in your QQ Mail account. The qqmail service has a couple different ways to add new contacts, including really convenient tools to import all of your contacts from another email account. We’ll look at all of the options so you can use the one that’s best for you. 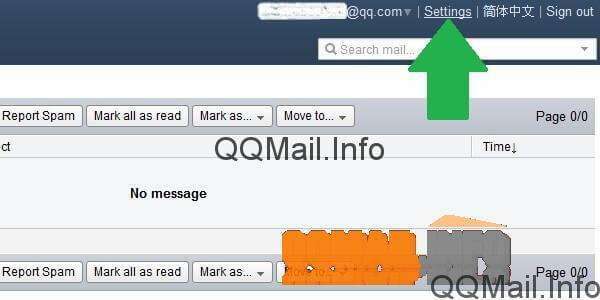 First, make sure you are logged into your qqmail account so that you’re looking at your inbox. 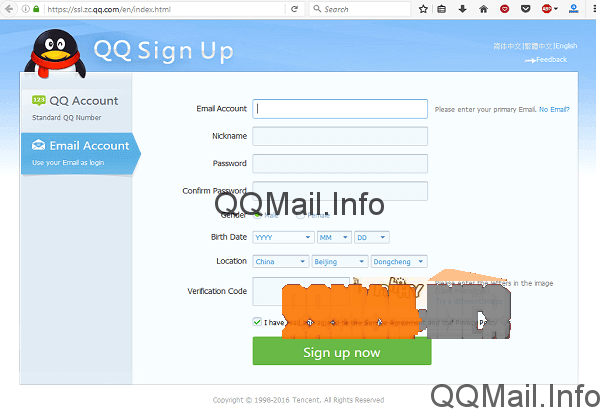 If you aren’t sure how to sign in, refer to our post of signing in and out of QQ Mail before proceeding. 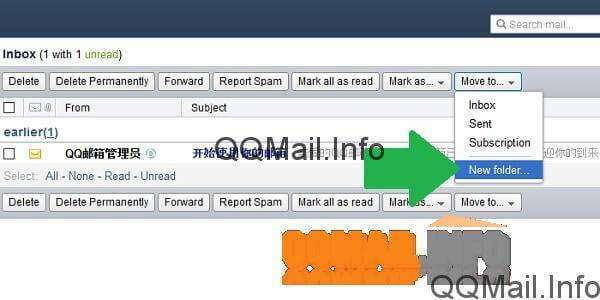 Once you are looking at your inbox, you will go to the “Contacts” section of your account by clicking on the link that says “Contacts” in the left sidebar. 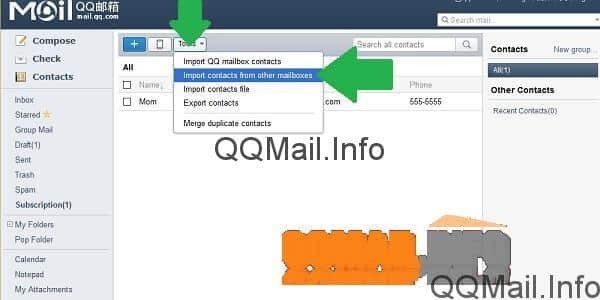 From here, you have three different ways to add new contacts in QQ Mail: adding manually one at a time, importing from a mobile device, and importing from another email account. 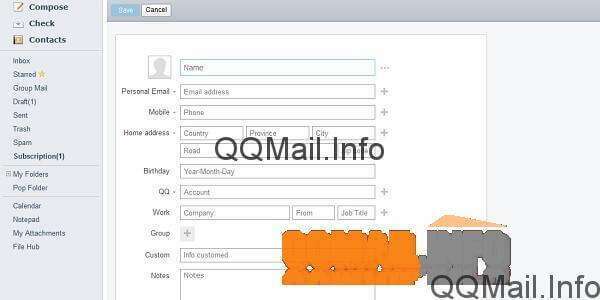 If you just need to add a couple people into your email contacts and you have their information handy, you can add a new contact manually. It’s very easy to do. On the Contacts page, near the top of the screen there is a blue button with a big “plus” sign on it. This is the “add new contact” button. Note: if you have an empty contacts folder, like I do, you will also see a link that says, “No contacts. Add one.” This will do the same thing as the “+” button. 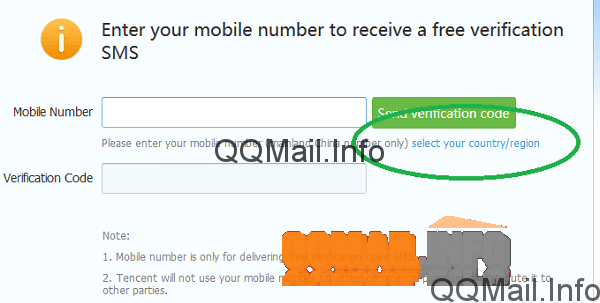 This will open up a fairly self-explanatory form for you to enter in the new contact’s information. You don’t have to fill in every field. If you don’t know or don’t need someone’s phone number, for example, that’s okay. 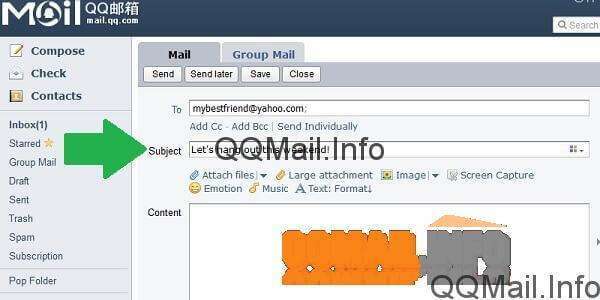 But since this is your email contacts book, it’s best to have an email address for everyone you add. After you enter in all the information you want (I would recommend at least their name and email address), click on the “Save” button at the top of the screen. 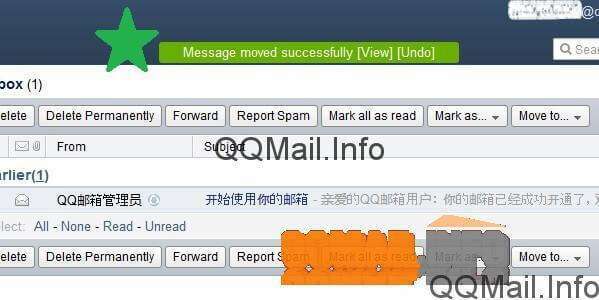 You will be taken back to the main qqmail Contacts page, and you should get a little green notification that says “Saved successfully”. Also, the new contact you just added should appear in the list now. Back on the main Contacts page, next to the “+” sign to add a new contact manually (as discussed in the previous section), there is a little gray icon that looks like a mobile phone. This is the “import contacts from a mobile device” button. Now, here’s the thing about this button. 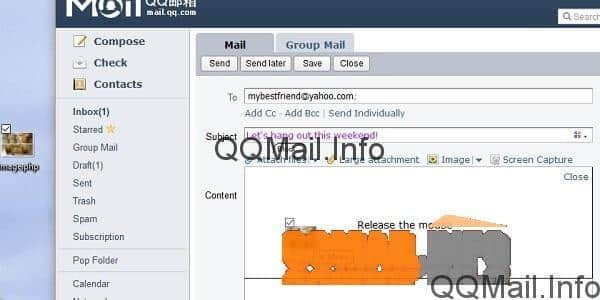 When I tried it, I got a popup window that presumably would have had some sort of verification to send the contacts from my phone into qqmail. Except in that popup, it said the page no longer existed. 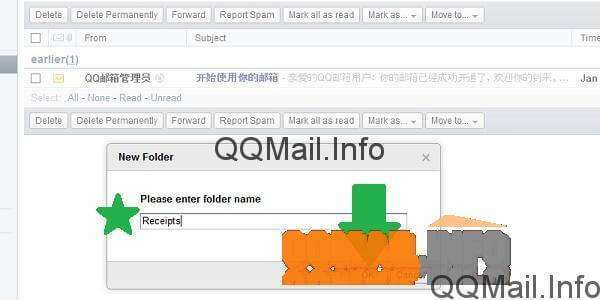 So I’m not sure if QQ Mail no longer supports this (which seems unlikely), or maybe the English version is just out of date. 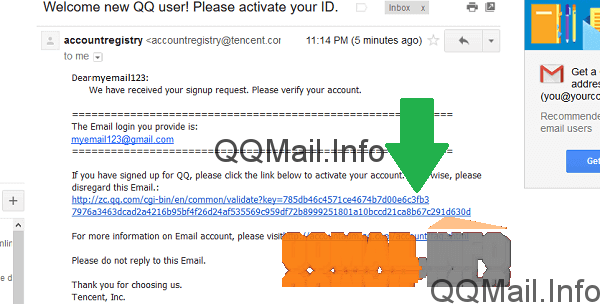 If you use the QQ mobile app, you might have better luck with his. It’s also entirely possible that in the time that passes between when I tried to do this, and when you try to do this, it will have been fixed. It could work perfectly fine for you. If the mobile import doesn’t work, there is a way to get around it – sort of. 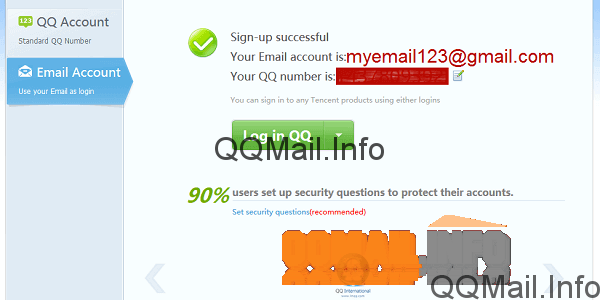 It involves using the “import from another email account” tool. My thinking here is that if your primary email service is already synced to your mobile device (which is common with Gmail/Android, Outlook/Windows Phone, etc. 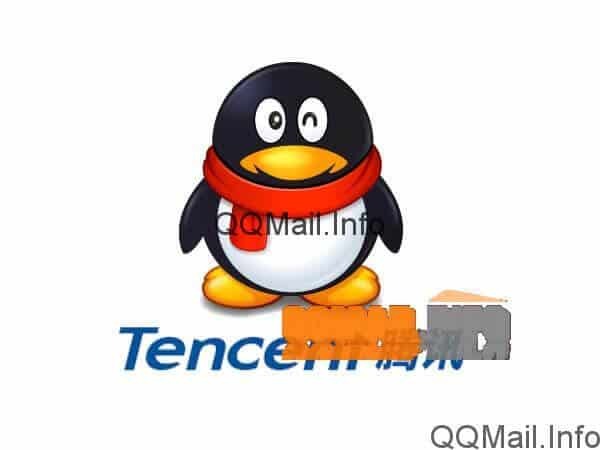 ), then importing from your email is indirectly importing from your mobile device. We’ll look at that in the next section. 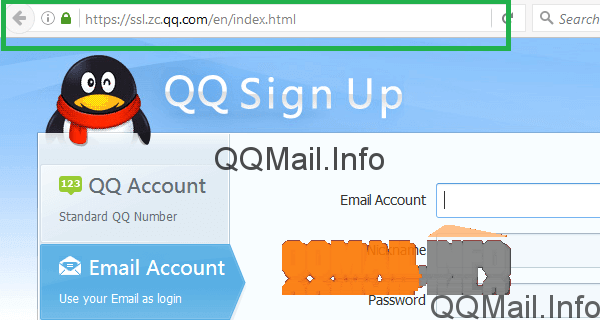 If you use some other email service as your primary account, you can most likely import all your email contacts from that account into qqmail. Not every email platform is available to do this, but most of the big ones are. To get started, go back to the main Contacts page, and go to the third button at the top of the screen. It says “Tools”, with a little arrow pointing down. Click on it. This will open a drop-down menu of different tools you can use to import contacts. 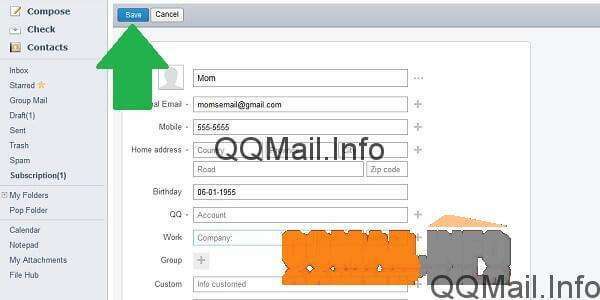 The first option in the list can be used if you have another qqmail email account that you want to import contacts from. 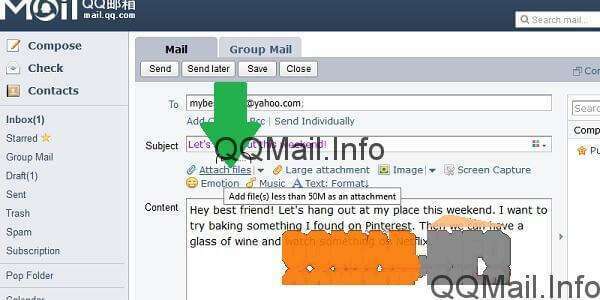 The second option lets you import from other email services. The third one lets you import contacts from a file, which I imagine would work with a spreadsheet in Excel. 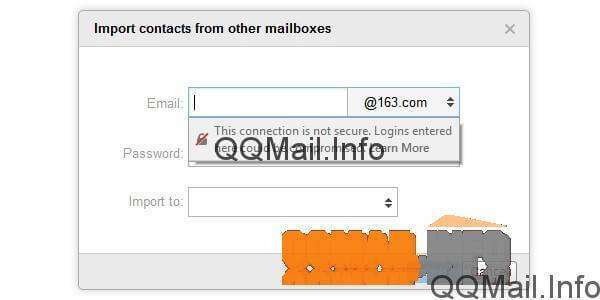 For the purposes of this tutorial, let’s click on the “Import contacts from other mailboxes”. 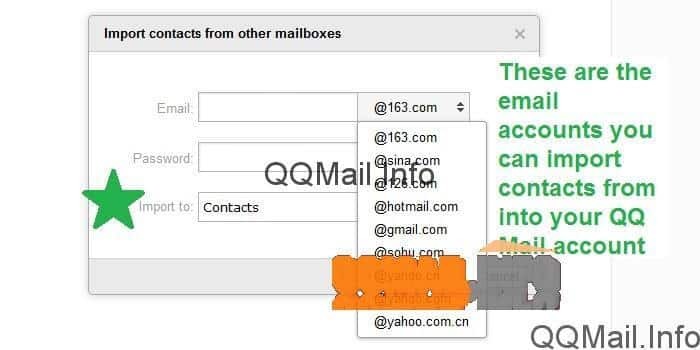 Clicking on that option will create a little popup where you will enter the information of the email account you want to import from. 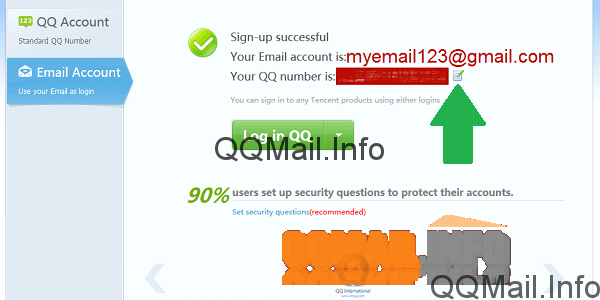 It’s a good idea to double check whether your email platform is supported here. 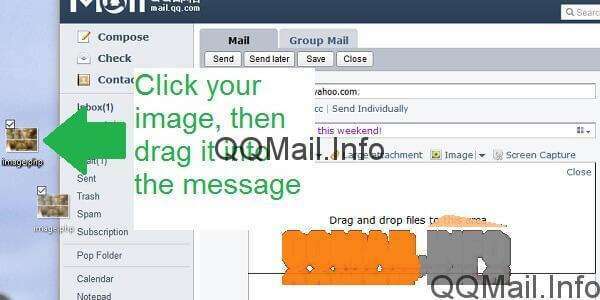 To do that, click on the little arrows next to the email domain “@163.com”. 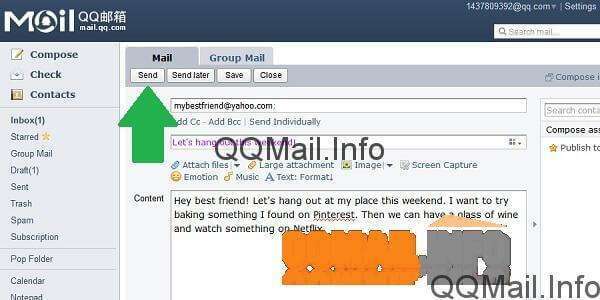 Hotmail, Gmail, and Yahoo email addresses are supported. 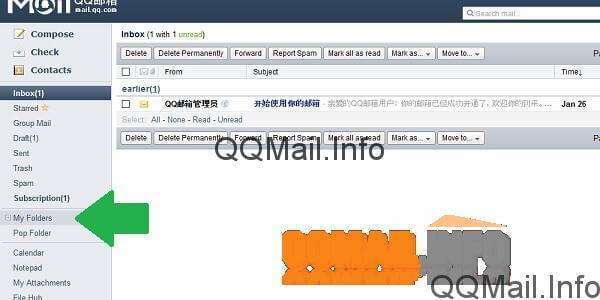 Just select the correct email domain, and make sure you don’t get mixed up by selecting “@yahoo.cn” instead of “@yahoo.com”, for example. 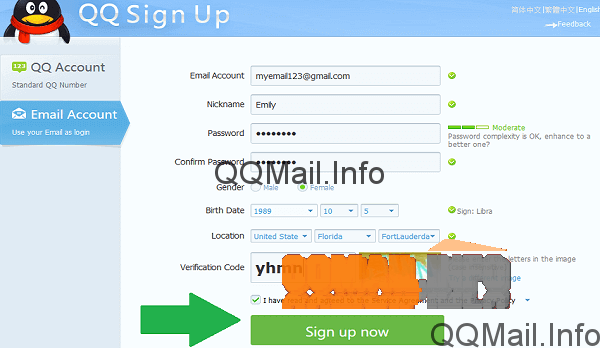 Then, enter your email address and the password for that other account. Finally, make sure that the “Import to:” field is set to “Contacts”, and click “OK”. 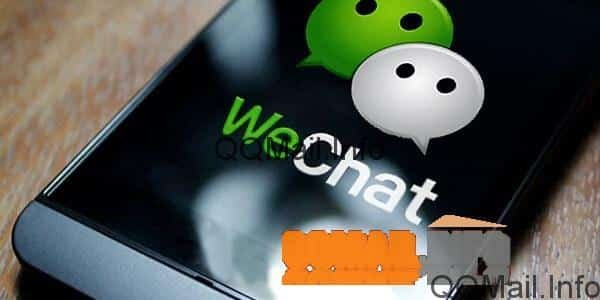 The import process could take a few minutes depending on your connection and how many contacts you have. 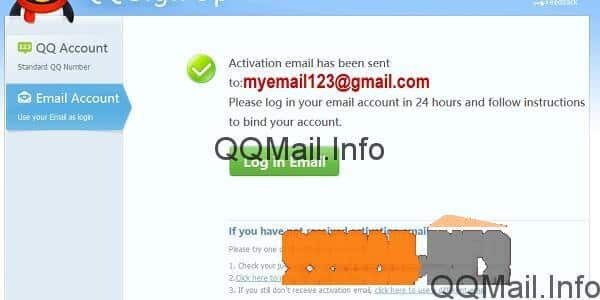 If it doesn’t work for some reason, I would recommend checking the settings in your other email account. There might be an option there to export your contacts. 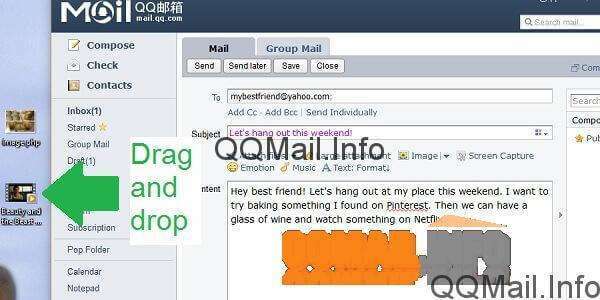 If so, you would just enter your qqmail email address and password to send the address book over. When you are looking at the main Contacts page, the top of the screen will normally display those three buttons we talked about in previous sections of this post: the “+” button, the “mobile” button, and “tools”. However, if you mark the checkbox next to any contact in the list, a new set of buttons will appear: “compose”, “delete”, “add to group”, and “merge”. The blue button with the “X” looks like it would mean delete, but it actually means “unselect”. Note: if you only have one contact selected, the “merge” button will be grayed out. 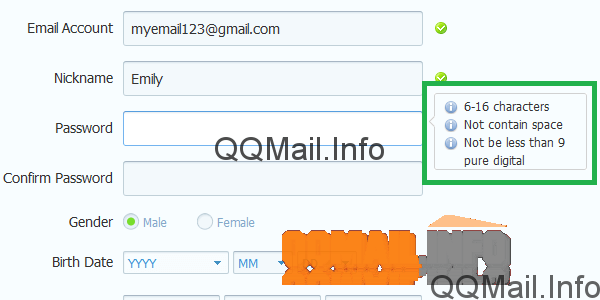 You need to have two or more contacts selected in order to merge them into one. If you want to edit a contact, to add additional information or fix a mistake, you won’t click on any of these buttons. Just click on the contact itself, and you’ll be taken to another page with the option to edit. 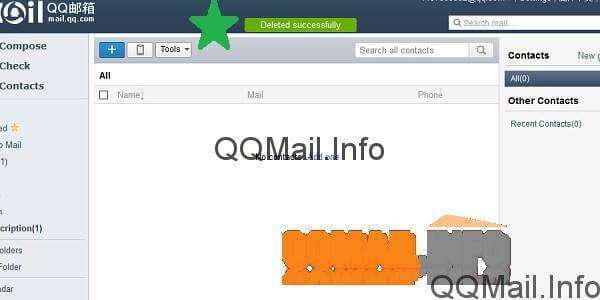 Deleting a contact in QQMail is simple. 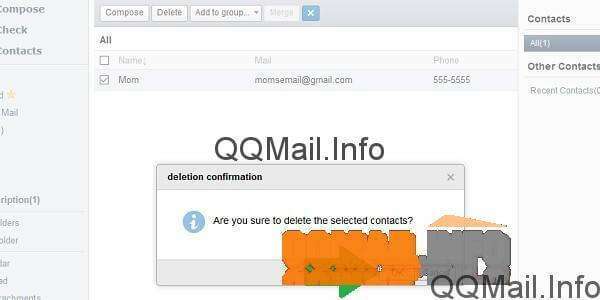 Just select the contact by marking the checkbox, and click the “Delete” button. Then, click “OK” to confirm you want to delete them. You’ll get a notification that says “Deleted successfully”, and you will see that the contact is no longer in your list. 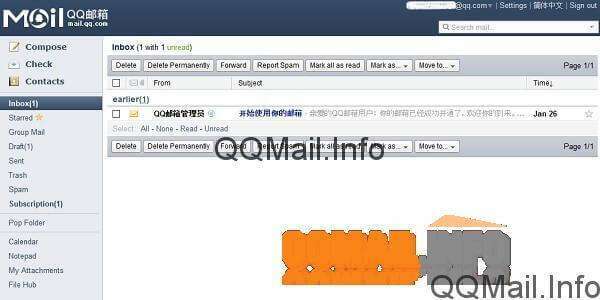 Now you know all the different ways to add contacts in QQ Mail, and also how to delete contacts. Managing groups of contacts is beyond the scope of today’s post. 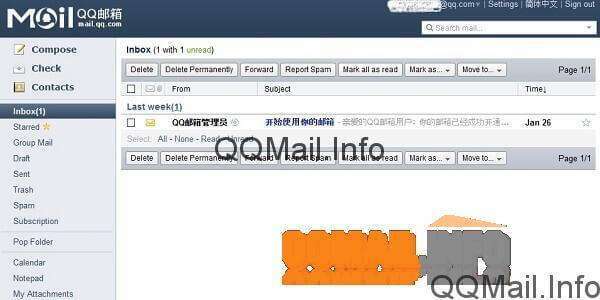 We’ll cover it later when we talk about tips and tricks in QQ Mail. 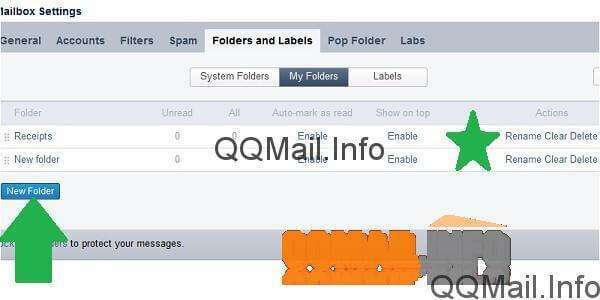 Make sure to check out our next post on saving important messages in QQMail. 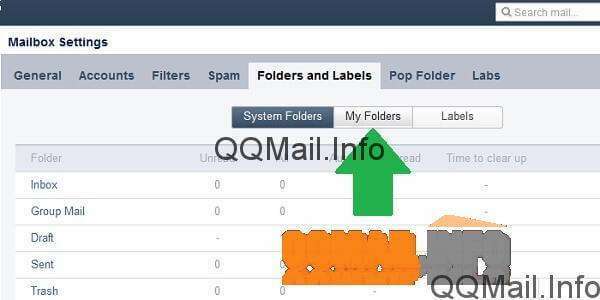 Folders are one of the simplest and most intuitive ways to keep your email inbox nice and organized. 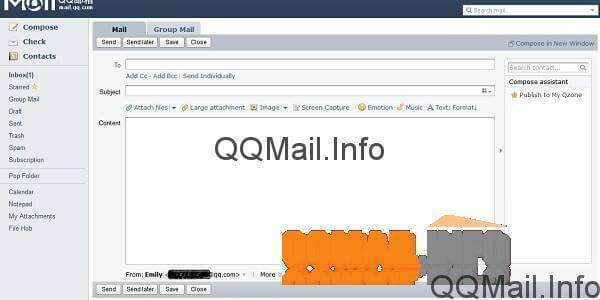 The ability to create and manage folders is a basic function in modern email platforms, including QQ Mail. 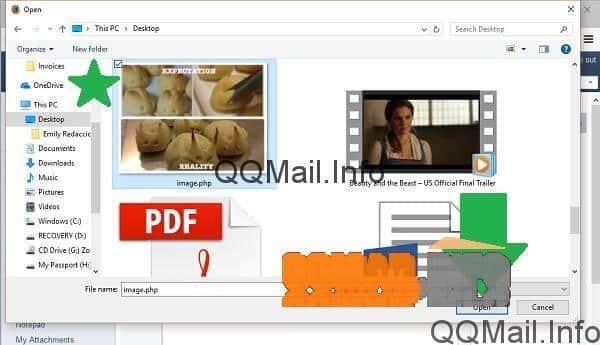 The good news is, QQ Mail makes it extremely easy to create new folders to organize your different categories of email, and managing those folders is pretty simple too. 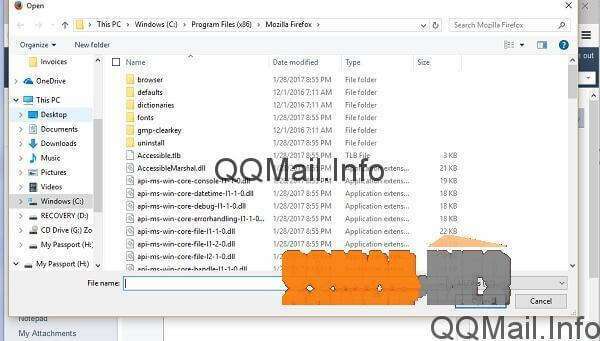 In this tutorial, I’ll walk you through all the different ways you can create a new folder in QQMail so you can pick the one you like best. And at the end, I’ll also give you a quick look at how to manage the folders you’ve created. 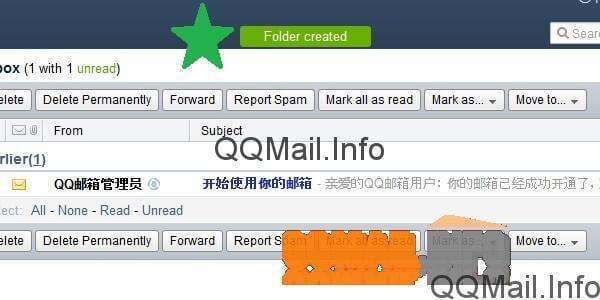 The first way I’m going to show you to make a folder in QQ?? is my favorite, and I think it will be your favorite too because it’s incredibly easy to do. 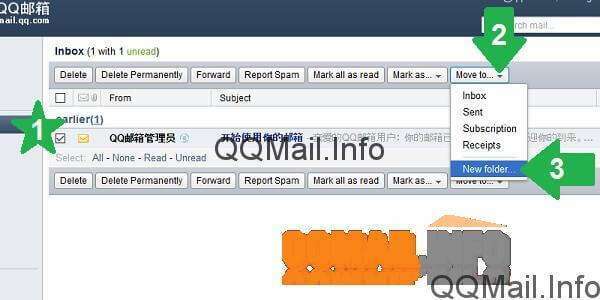 Up at the top of your mailbox (but not the top of the screen), there are several different buttons. The button on the far right says “Move to…”. 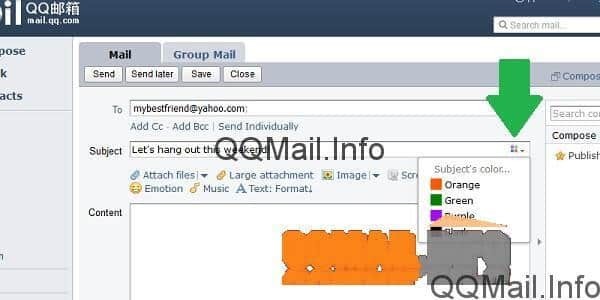 You can use this button to quickly and easily create a new folder in qqmail, and despite the wording of the button, you don’t have to have a message selected for it to work. So, start by clicking on the “Move to…” button. 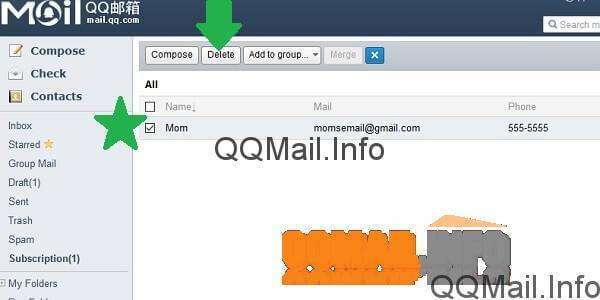 Doing this will open a drop-down menu with all the folders that are currently in your account. At the bottom, there is the option to move to a “New folder…”. Click on this last option. Now, you’ll get a popup box where you will type in the name of the new folder you want to make. It can be whatever you want – it just depends on what you intend to put in the folder. I always like to have a separate folder for receipts from online shopping, so I’m going to call my new folder “Receipts”. Once you’re satisfied with the name of the folder, click “OK” to create it. And don’t worry – you can edit the name later if you change your mind. You should get a temporary notification at the top of the screen letting you know that your folder was successfully created. 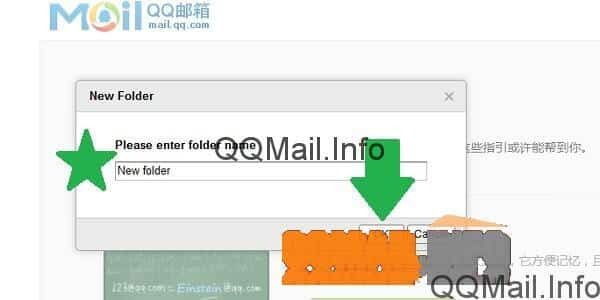 Now, your folder will appear in the left sidebar of your QQ Mail inbox. Look for the tab that says “My Folders”, and you should see that it has a plus sign next to it, which means you can click to expand it. When you click on “My Folders”, it will unfold the list of all the folders that you have created. As you can see, my new “Receipts” folder is there, right where it should be. If you have a specific message that you want to move into a new folder right away, you can create the folder and move the message all in one fell swoop. 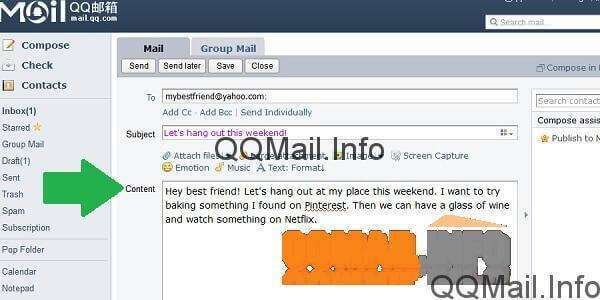 You can do this from your inbox view or while reading the message, whichever is more convenient. Check the box next to the message you want to move. Click on the same “Move to…” button from the first method. Select “New folder…” just like before. 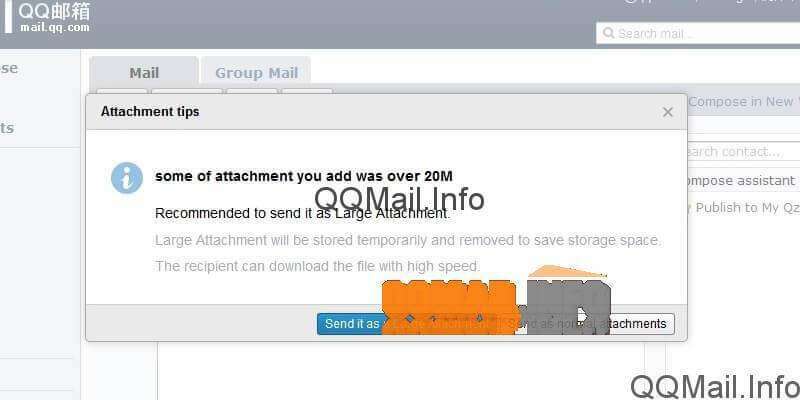 Alternatively, if you’re reading the email when you decide you want to move it to a new folder, all you have to do is click on the same “Move to…” button at the top of the mailbox, and select “New folder…”. However you do it, you’ll get that same popup asking you to name the new folder. Just type in the name you want, and click “OK”. 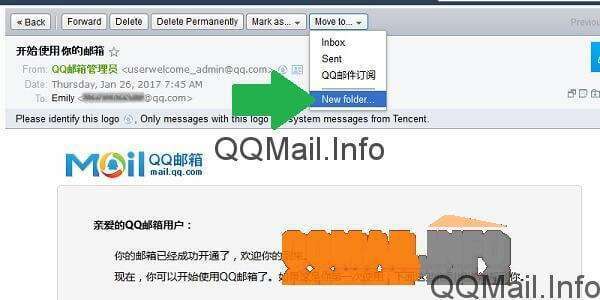 If you create the new folder from a message using either of these two methods, your notification will be different from the “easy way”. You should get a notification saying “Message moved successfully”. 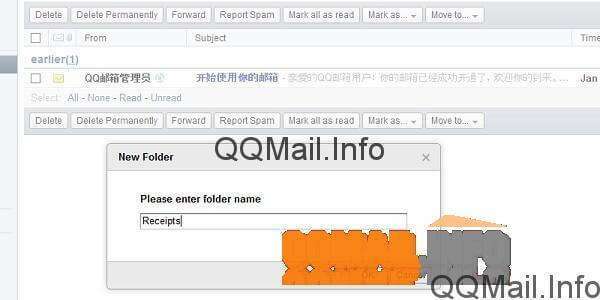 That, of course, means that the folder was also created successfully. 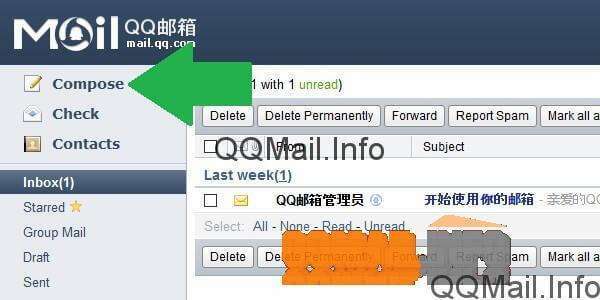 The last way you can create a new email folder in QQ Mail is through your mail settings. This is also how you can access all of your created folders in case you need to change or delete them. 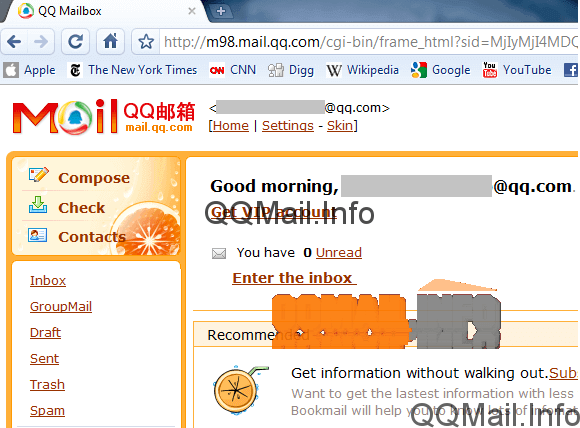 First, go up to the top of the screen next to where your qq email address appears, and click on the “Settings” link. 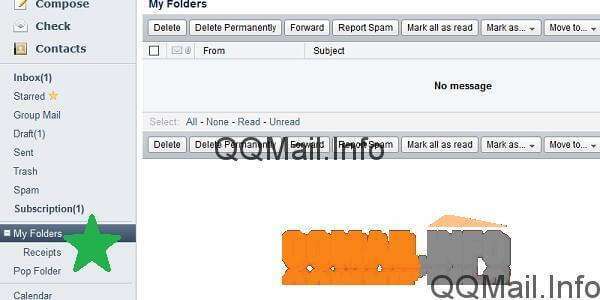 This will take you to the general tab of your mailbox settings. To create a folder, you need to go to the tab called “Folders and Labels”. The main view here is the system folders, which are the ones that came with your account and which you can’t change (e.g. Inbox, Trash, etc.). To create a new folder, you want to click on the button that says “My Folders”. Here, you have a blue “New Folder” button to click, and the rest of the process is the same as before: name the folder, and click “OK”. Note that this tab also contains the two folders that I created in this tutorial (“Receipts” using the easy way, and “New folder” from a message). If you ever need to change the name of a folder, empty it, or delete it completely, you can do that here too (as indicated by the star). 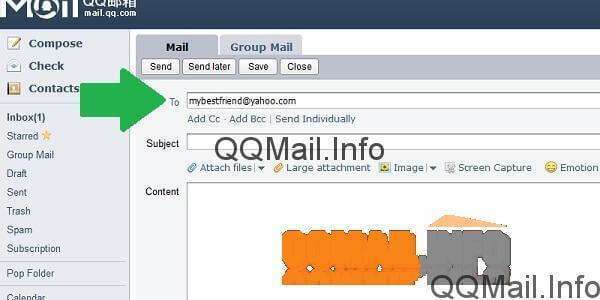 So, as you can see, creating a new folder in your QQMail email is very easy to do, and you have several options depending on the situation and your preferences. 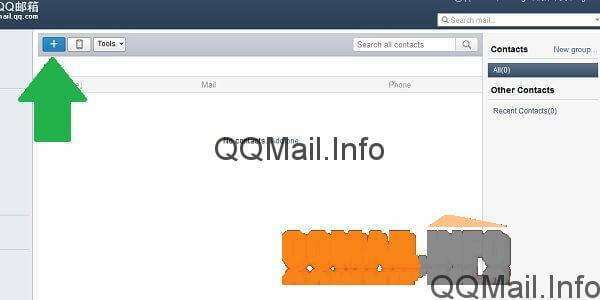 If you have other email accounts on other platforms and want to consolidate everything in one place with QQMail or your other email account, don’t miss our next tutorial on how to set up mail forwarding in qqmail.